Welcome to the blog of NØBEL, Kevin. Here you'll find some of my ramblings and my projects. Look on the left for the main menu of articles. Check out the projects page. This project has been kicking around for years. Several years ago I set up an 8 zone lawn sprinkler system. You know those 24vac controlled valves and sprinklers and stuff. ESPrinkler has been upgraded to ESPrinkler2. It is still a DIY project, not for the feint of heart, but still a fun project. ESPrinkler2 has its own home on GitHub https://github.com/n0bel/ESPrinkler2 It even got a couple of stars, without it even being finished. 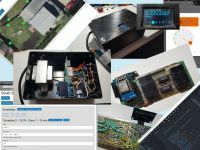 Its page has been updated on https://hackaday.io/project/6212-wifi-lawngarden-sprinkler-controller-esp8266 as well.